Define Trojan Horse | How a Trojan Horse Operates? Trojan horse, in computing, is a malicious program that seems like an ordinary program. It can surprisingly change any computer settings and cause unusual activities. Even if no one has used the computer in a while, a Trojan can possibly reside on a computer. 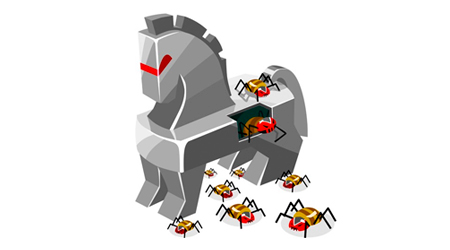 The Trojan horse is often mistaken for the Trojan horse virus. The difference between them is that the Trojan horse virus has the ability to replicate itself; the Trojan horse can't do that. This is the reason why many cyber criminals tricks make the unsuspecting endpoint users download and install the Trojan horse. When the Trojan finally gets into the endpoint, it can do whatever task the attacker designed it to carry out. In 2010, the PCWorld.com reported that there were 480,000 Trojan horse attacks in China. Plenty of online users are unaware of activities that an installed Trojan horse can execute. Though, a prepared online user should have updated antivirus software and always avoid unknown links and files from their emails; a trusted antivirus can identify malicious code, isolate it and remove it. can provide cyber-criminals access over the endpoint. can download and install a virus or worm to abuse vulnerability in another program. can record keyboard strokes to steal the user's account data and browsing history. can turn on the computing device's camera and recording capabilities. can place a ransomware to encrypt the user's data and extort money for the decryption key. can turn the computer into a zombie bot that can be used to carry out click fraud schemes or illegal actions. can legally acquire information useful to a criminal investigation for law enforcement. It starts when the victim receives an authentic-looking email with an attachment. The attachment surely carries a malicious code that will be activated when the victim downloads the attachment. Most of the time, the Trojan won't be detectable. The computer will continue working as usual, yet it's already infected with a Trojan horse. The Trojan horse stays undetected until a specific date or until the victim carries out a specific action, such as visiting an online banking website. At that time, the trigger activates the malicious code and carries out its intended action. The Trojan horse can also be made to delete itself after it has done its intended function. It may return to a dormant state or it may continue to be active.